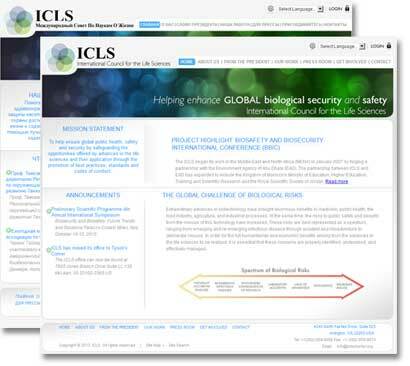 The International Council for the Life Sciences (ICLS) is a non-profit, non-partisan organization dedicated to enhancing global biological security and safety and reducing the risks of the misuse of the life sciences. A custom website with CMS (Content Management System) built soley for ICLS. The site and MSSQL (Microsoft SQL) Database are in three languages: English, Russian and Arabic. All text is pulled from the database, and is easily editable by novice site administrators. ASJ Company also provided a new coroporate brand and collateral materials.